Volunteers updated the information since 2011 by taking digital images of tombstones in October 2015 and then uploading info and images to our website. Thanks to Wally Goodman, Ruth Goodman, Beau Garland, Lynn Shumaker and Regina Shumaker. Thanks to the GPGS volunteers who photographed the cemetery in October and November 2011: Ben Grimes, Carol Franklin, Howard McCalla, Lynn Shumaker and Regina Shumaker. 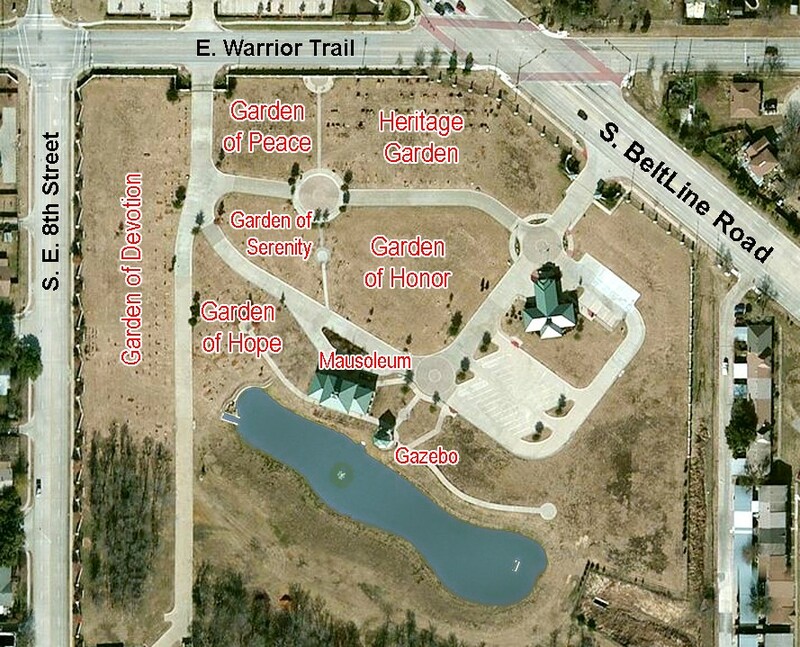 Grand Prairie Memorial Gardens are located at SW corner of Beltline and Warrior Trail. 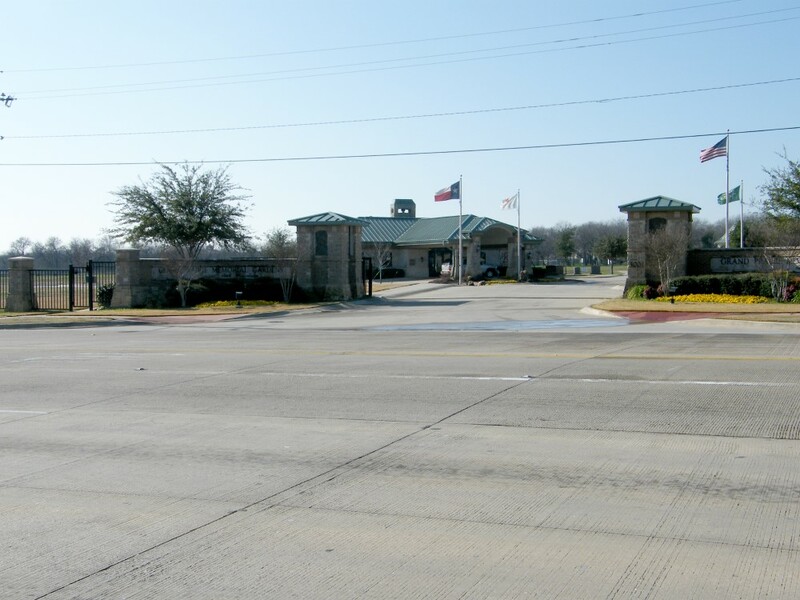 Opened in 2004, it is the newest of the cemeteries located in Grand Prairie. 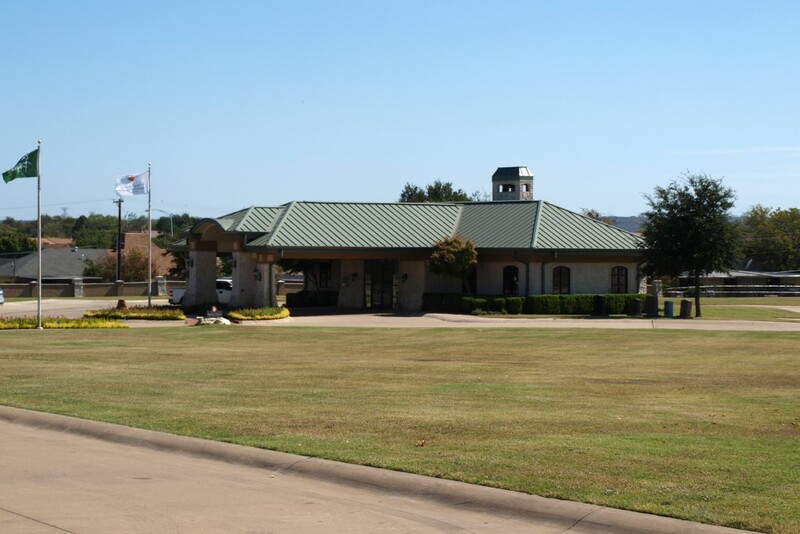 It is owned and operated by the City of Grand Prairie and is a 25 acre perpetual care facility with five gardens; Garden of Hope, Garden of Peace, Garden of Serenity, Garden of Honor and Heritage Garden. 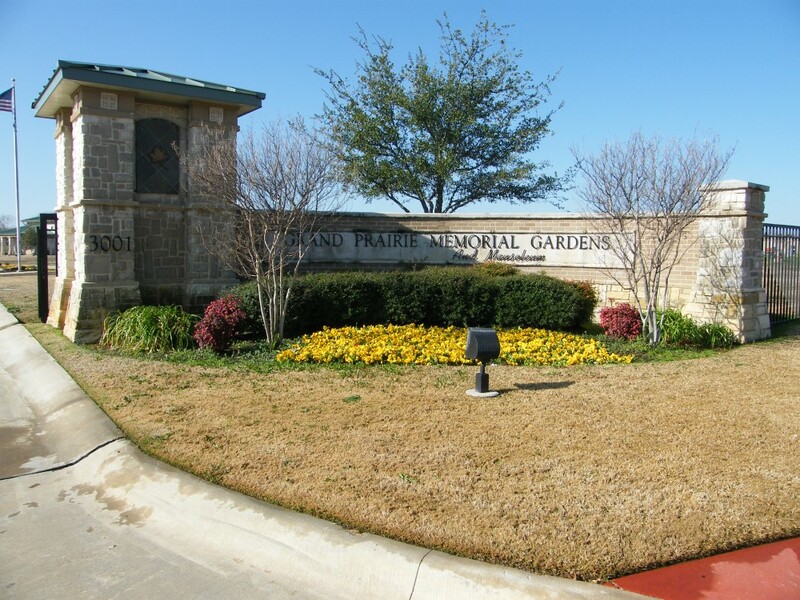 “Reverence and serenity embrace the gardens and grounds, giving comfort to loved ones and solace to the soul.”1 Grand Prairie Memorial Gardens is diligent in keeping beautiful grounds and providing excellent service. 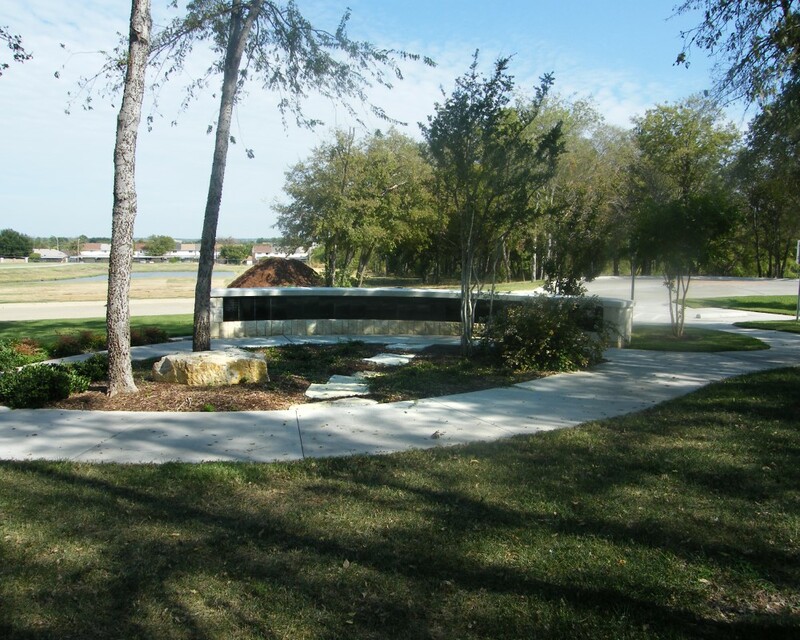 A peaceful reverent atmosphere is achieved through the landscaping, the soothing pond with a fountain, and Memorial trees. Their caretakers are dedicated to working diligently to restore grave sites to a healthy healed site within a couple of weeks of burial. 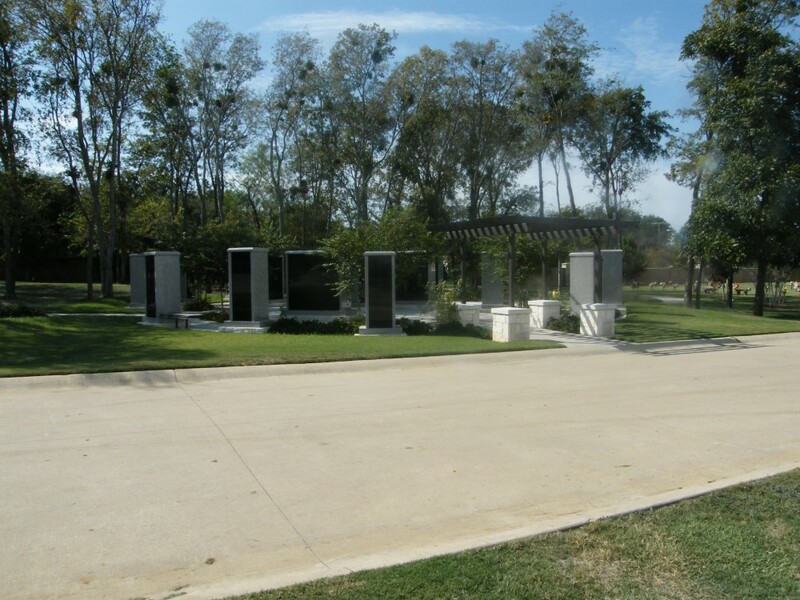 Grand Prairie Memorial Gardens grounds contain a beautiful Mausoleum accented with limestone, a Mausoleum Chapel for meditation, visitation and memorial services, Crypts for above ground casket burials, Columbarium Niches for cremated remains, and a Gazebo near the soothing waters of the pond which also contain niches for urns. 1 Description taken from Grand Prairie Memorial Gardens website at www.grandprairiememorialgardens.com.